Bitcoin is the up and coming currency that allows people to transfer funds independently of the regulation of any middleman or central bank. Merchants are increasingly accepting bitcoin as a standard form of payment, and consumers can store them away in digital wallets stored in the cloud like a virtual bank account. Bitcoins have been around since 2009, and can now be purchased using various currencies on bitcoin exchanges and now you can even add cryptocurrencies to your retirement account through a Bitcoin IRA (sometimes spelled bitcoinira). Because bitcoins are neither printed like physical currency or minted like coins, there’s no central bank printing extra money and devaluing the worth of the currency. There is also no risk that any “central authority” could confiscate your bitcoin money in the event of any financial meltdown. Bitcoin is a disruptive technology; it will do what email did to the post office. And at this point, we are just at the beginning, much like AOL in the early days of the internet. This is the projected trajectory of bitcoin; it may strike people today as a novelty, but it is on its way to becoming the way people do business, both nationally and internationally. There are no banks or clearinghouses that issue bitcoins. Instead, they’re created in a peer-peer network through a complex mathematical system referred to by industry specialists as “mining”. It’s this mining system that gives bitcoin privacy and very strong fraud protection. This method of bitcoin creation prevents a central bank from simply dumping an immense quantity of the new currency into the existing network. Unlike other currencies, like the dollar, for instance, bitcoin has a built-in mechanism for preventing debasement. Other than mining, one can acquire bitcoin through various exchanges or by buying it through an IRA. You can become a bitcoin user simply by installing a bitcoin “wallet” on your computer or mobile phone. It’s an application and functions similar to any other payment application on your phone or computer but has even more functionality and is more secure. It houses the digital code so you can use your bitcoins securely and keeps a transaction record. Bitcoin transactions are recorded in a blockchain, which is a public ledger accessible to bitcoin users. All transactions are confirmed and recorded here through the mining process. Accessible balances are calculated and new transactions and can be verified in each blockchain participant’s wallet. The record is permanent and cannot be changed, altered, or hacked. 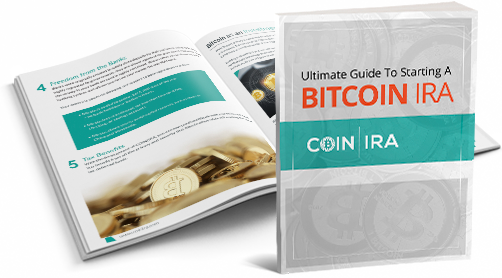 Our Bitcoin IRA program is the result of countless hours of planning and research. It offers one of the safest and most convenient ways to invest in bitcoin. While starting your own digital currency wallet can offer a degree of flexibility, it is not the most secure or easiest method; it exposes you to risk of your wallet or exchange being hacked. A normal online wallet offers no encryption out of the box; you are responsible for encrypting, storing, and insuring your crypto. If you misplace your key or damage your physical wallet, your cryptocurrencies can be lost forever. In a digital currency IRA, your crypto is triple encrypted and stored in an offline wallet + cold storage, making it hacker proof, protected in case of physical or natural disaster, insured against theft. Working with a reputable company can also make the process seamless. If you already have an IRA or 401(k), we can handle the rollover or transfer process for you and we can assist you in using your retirement funds to take advantage of this once in a lifetime opportunity. As you look at setting up an IRA for investing in bitcoin, you have some options to consider. The first question is whether you want a traditional IRA or a Roth IRA: most people opt for the Roth when they make investments. You’ll have to pay taxes at the time that you fund your IRA with contributions, but then you won’t have to pay taxes when it comes time to take distributions out of your IRA. Since you’re planning on having more money at that later date, due to your successful investments, you’re better off paying taxes on the lesser amount up front. You can fund your IRA with a personal contribution, up to the allowable amount for the year, or roll over funds from existing IRAs. Bitcoin is not specifically listed as a permitted IRA asset, but it is not excluded either. It certainly doesn’t fit among the assets that are prohibited (like stamps, gems, antiques, or artwork) and there are no regulations specifically addressing their use in IRAs. In that sense, they are something of a gray area, but with brokers offering specific bitcoin IRA options to consumers, there is now plenty of precedence for the approach. Additionally, the IRS has now given its tacit approval with the approval of Bitcoin, a portfolio for retirement investment that is dedicated to the bitcoin market. There’s no question, bitcoin is the up and coming currency of the future, and its value is only increasing with time. A bitcoin that was worth ten cents just a few years ago is now valued at over $10,000 dollars —and as you read this, even that number is likely to be outdated. Bitcoin is increasingly accepted as currency for local as well as large-scale transactions, and the anonymity of the digital crypto wallet appeals to many consumers. With its lack of centralized regulation, taxes are not applicable until a person converts bitcoin back to dollars, and (if you’ve chosen a Roth IRA) your bitcoin income will be tax-exempt in any case. However, it is one of the reasons for the burgeoning popularity of the bitcoin. It’s growing in value at a rapid rate, both in usage and value, which makes it a great investment for your IRA. The biggest takeaway is the upside you can have in your retirement account. It is always recommended to have a diverse retirement portfolio. Cryptocurrency offers a huge upside. A $200 investment in 2011 is currently worth over 1.2 Million dollars! A $20,000 investment in 2012 is currently worth more than 5.3 Million dollars. Just this year, Bitcoin has rose over 1500%. The sky is still the limit, so act now before you miss out on the opportunity of a lifetime! Once you are ready to get started, fill out the form above and we will send you a free cryptocurrency retirement guide.